The EverGen M Series is a robust solar outdoor lighting system with the durability and quality Sol is known for. Designed from our 25+ years of expertise, this solar commercial light is configurable to meet various lighting applications. 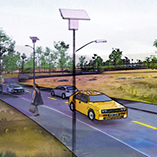 Whether you need a solar street light, park or path light, parking lot light, or a general area light, your EverGen will be customized for your project location to provide the light you need over the long term. A combination of better solar panels, high efficacy LED luminaires, a 10-year battery, a unique energy management system (EMS), and our industry-leading sizing processes all ensure your EverGen will provide light every night of the year at your required light levels. Sustainable: Demonstrate your commitment to sustainable design; add light to environmentally sensitive locations or where grid access is poor. Efficient: Eliminate electricity bills, avoid costly trenching and wiring, and complete no maintenance for the first five years. Compliant: Ensure compliance with IES light level recommendations for your application. Smart monitoring: Avoid outages with remote monitoring that tells you when lights need attention. Dark-sky controls: Minimize light pollution with directional fixtures and scheduled dimming, ensuring no wasted light or wasted money. Warmer light: Enjoy warmer-white LEDs while still meeting required light levels. Reliable and built tough: Get a system assembled in the US with quality US and imported parts; all systems include a standard 10-year warranty and 5-year battery warranty, with an extended-life 10-year battery upgrade available. Our proprietary energy management system (EMS)—the brain of the light—optimizes incoming solar energy and outgoing DC power efficiently, meaning we can build smaller system sizes with fewer solar panels and batteries. We use high-efficacy light fixtures and luminaires to achieve high lumen output with less power, meaning we can specify fewer total systems per project and still meet your light level requirements. In the example to the right, our lights may be more expensive than a competitor per lighting system, but since only 3 systems are required to meet the same light levels and uniformity as the 8 required by the competitor, our overall project cost is lower. 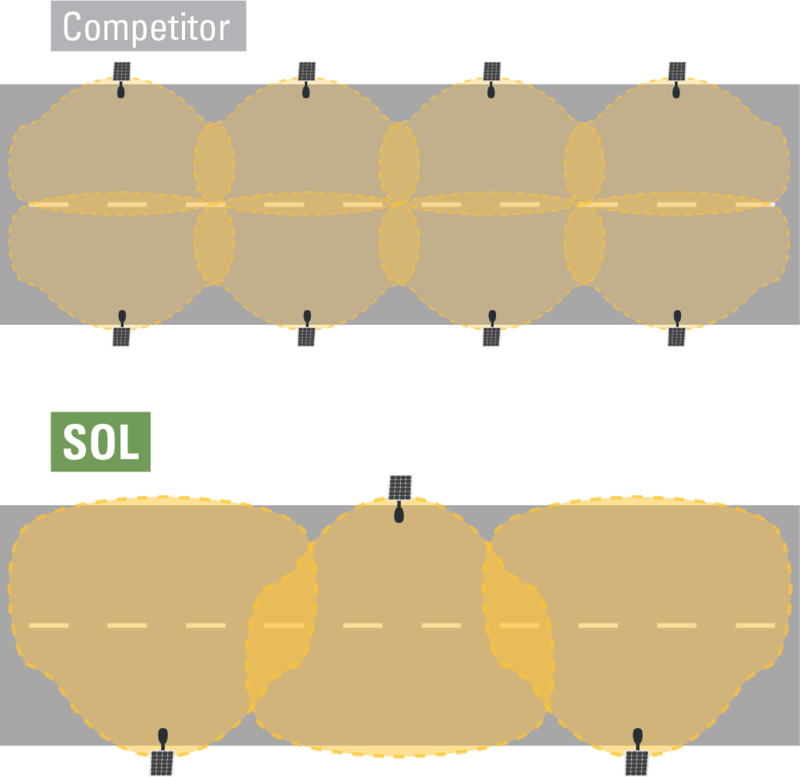 Check out our solar street light comparison chart to see how our solar street light compares to the competition—those both on and off the grid. Sol’s EverGen can meet required light levels and uniformity with fewer systems than other solar light competitors. 2. We build it tough, with a 10-year warranty. 87% of our EverGen light is manufactured in America, built to last with quality US and imported parts. Since they are designed to withstand heat, cold, wind, and moisture, we’re confident your EverGen solar lights will work over the long term. To prove that we stand behind our product and its performance, we include a 10-year municipal-grade warranty for both the system and batteries. 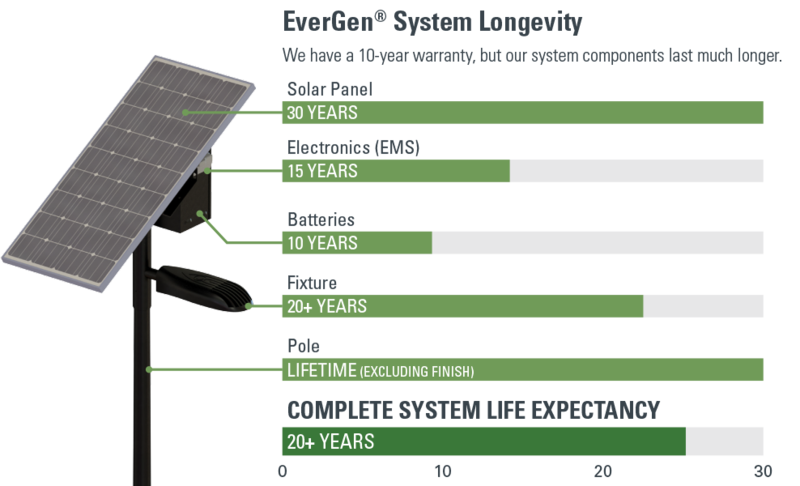 We’re the only solar lighting manufacturer offering a 10-year warranty on our system and batteries with proper autonomy (4+ days of backup power). With our EverGen solar light, your entire project can be commissioned and lit in a single day using only standard equipment—no local utility needed. 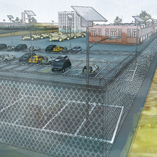 The light system and poles install without costly trenching and cabling for grid connection. All installation hardware—including standard tenon mounts, fixture arms, solar panel mounting brackets, and battery cabinets—ship and arrive together as a complete kit. Our contractor-friendly, plug-and-play setup requires no certified electricians and can be completed with standard tools and a bucket truck/crane. Once installed, our EverGen Setup App makes commissioning your EverGen light easy. Available for iOS and Android devices, our Setup App syncs with the EverGen’s on-board smart technology via Bluetooth wireless technology and guides you through a few short steps to get your light up and running. Your lights can be ready for operation the same day they are installed with no additional site visits required. Watch our video to see how easy our EverGen is to install. Learn more about our EverGen Setup App. Check your light status any time with our easy-to-use, cloud-based dashboard. 4. Remote satellite monitoring keeps you informed. Solar-powered outdoor lighting is virtually maintenance free, since the batteries don’t require regular service. Plus, every EverGen solar lighting system includes free LightGuard™ remote monitoring, which uses GPS technology and satellite connectivity to pinpoint system faults and performance levels. When one of your lights isn’t working as expected, the system sends automatic email notifications so your team can locate the light quickly and fix the issue. Upgrade to LightGuard Plus to check light status anytime with our easy-to-use, cloud-based dashboard and create your own maintenance plan with automated notifications and system health updates. Learn more about remote monitoring and how integrating smart city technology can start with your lights. The Navajo Housing Authority purchased Sol's EverGen solar street lights and are pleased with the systems' ability to meet IES light level standards. 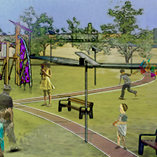 The City of Aurora’s Parks, Recreation and Open Space Department installed EverGen solar LED park lights in Discovery Playground and the adjacent parking lot. The Emirates National Oil Company installed Sol's EverGen M Series for a refinery expansion project to support Dubai's Clean Energy Strategy 2050. Determining the cost of your EverGen solar light is easy. All we need is your application, project location, and project dimensions. Choose an application below, then input your project information so our powerful sizing engine can build and test an EverGen solar light that meets your needs. The sizing engine takes your project location and runs it through thousands of environmental simulations to ensure each system performs as expected. Accurate sizing is the key to a cost-effective light that will perform exactly as you expect throughout its lifespan—and won’t prematurely kill your batteries. Once you receive your customized quote, you can then compare your solar lighting project cost to traditional grid-connected lighting. After reviewing the comparison, the next step is to contact us for a free detailed system overview and lighting layout, breaking down all the specifications for your project.